It’s the New Year and NAMM is now just around the corner. 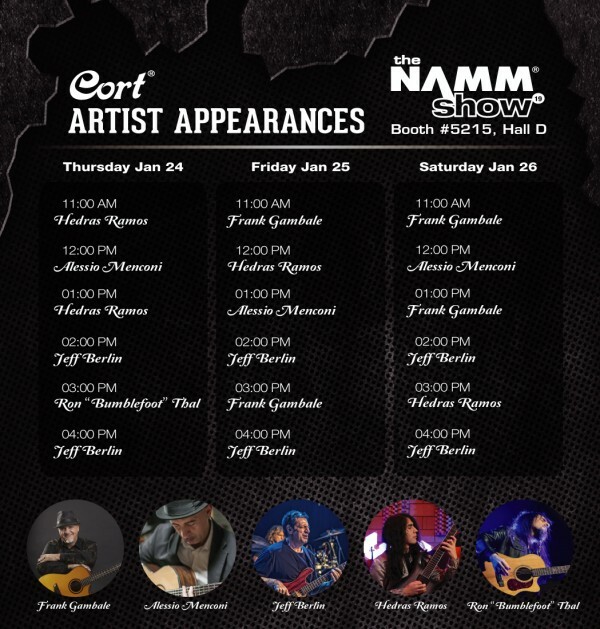 Cort will exhibit exciting new models for 2019 and also feature our esteemed artists at Booth #5215 in Hall D. Some of our top artists like Frank Gambale, Jeff Berlin, Ron “Bumblefoot” Thal, Hedras Ramos and Alessio Menconi will be present for multiple appearances during the first three days of the show. There will be short performances by the artists, and they will also mingle with the fans for autograph signing and taking photos. Come see these great world class artists in action and meet them in person at the Cort booth. Such events are what make NAMM a great way to kick off the New Year!